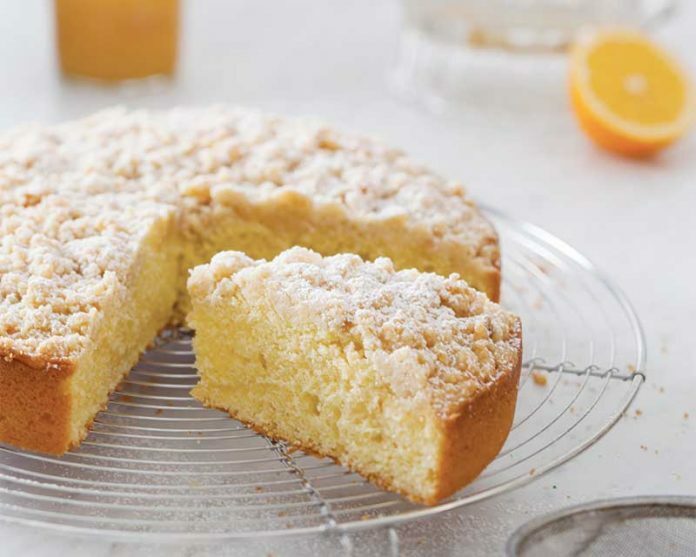 If you love lemon bars, you will LOVE this coffee cake. Meyer lemons are less acidic and slightly sweeter than the standard lemons found in the grocery store, and provide a perfect balance against the tart lemon curd swirled into this silky batter. Preheat oven to 350°F (180°C). Butter and flour an 8-inch round tall-sided cake pan. 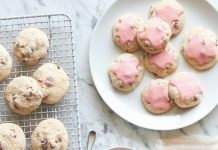 In a medium bowl, whisk together 3⁄4 cup (94 grams) flour, brown sugar, 1 1⁄2 tablespoons (18 grams) granulated sugar, 1 teaspoon(2 grams) lemon zest, 1 teaspoon (5 grams) lemon juice, and 1⁄2 teaspoon (1.5 grams) salt. Drizzle with 5 tablespoons (70 grams) melted butter, and stir with a wooden spoon until combined. Crumble with your fingertips until desired consistency is reached. Set aside. In the bowl of a stand mixer fitted with the paddle attachment, beat eggs, oil, and remaining 1⁄2 cup (100 grams) granulated sugar at medium-high speed until thick and pale yellow, 5 to 6 minutes. Stir in remaining 4 tablespoons (56 grams) melted butter, remaining 1⁄2 teaspoons (3 grams) lemon zest, and remaining 4 teaspoons (20 grams) lemon juice until combined. In a medium bowl, whisk together baking powder, remaining 1⁄4 cups (156 grams) flour, and remaining 1⁄2 teaspoon (1.5 grams) salt. With mixer on low speed, gradually add flour mixture to egg mixture, beating just until combined. Stir in sour cream. Pour three-fourths of batter into prepared pan. Spread with lemon curd, and top with remaining batter, smoothing top with an offset spatula. Sprinkle with streusel. Bake until a wooden pick inserted in center comes out clean, 30 to 35 minutes. Let cool in pan for 15 minutes. Run a sharp knife around edges of cake to loosen sides. Invert onto a plate, and then invert again onto a wire rack. Let cool completely. Garnish with confectioners’ sugar, if desired. Surprised by the small amount of batter! Why bother with 1c 1/4 of flour? If his turns out well I’d suggest doubling the recipe. Hi Iris, don’t let the small amount of flour concern you, this recipe has been tested by two of our recipe developers multiple times. Keep in mind it is only a single-layer cake and will have the crumb added on top. If you have any issues or questions, let us know! Meyer lemons are often difficult to find most of the time and especially in winter where I live. I will assume that the washed peel and the juice of commonly found lemons can be used instead. Would I need to alter the amount used to compensate for the difference in flavor? Hey Deborah! You should be fine to use regular lemons for this recipe. It might not be exactly as intense, but it’ll be close enough for government work! Can this recipe be doubled or tripled.? If so what changes to the cooking time would be needed. With the olive oil cake recipe I have, I use a tubed cake tin and can double the recipe to make a 5 inch high cake with fantastic results. Hey again Deborah! You may double this recipe but know that the bake time can increase by fifteen to twenty minutes. Be wary and keep an eye on it! Hi Scratch Team! Should I use an 8″x3″ cake pan or an 8″x2″? Thanks so much!! We recommend using an 8″ cake pan. Happy Baking! We used store-bought lemon curd in this recipe to save some time. You can, however sub in any home recipe you prefer! Hope you feel better soon! Hi Sally, thank you for reaching out! You will need 3 tablespoons (42 grams) firmly packed light brown sugar. Happy Baking! 1) In step 3 of the directions, the recipe says to add the remaining 1/2 teaspoon of lemon zest. It should be 1-1/2 teaspoons. 2) In step 4 of the directions, the recipe says to add the remaining 1/4 cups flour. It should be 1-1/4 cups flour. This is not a problem if you measure by weight as I always do. But the volume measurements are not correct.